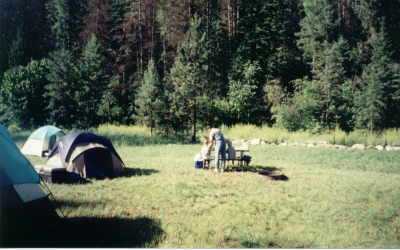 Beauty Creek campground is located in the Idaho Panhandle National Forest, next to Beauty Bay on Lake Coeur d’Alene. This is a medium size campground with a creek that runs through the back. The area is home to deer, elk, wild turkeys, black bear, mountain lions and bald eagles. The location makes for easy access to numerous outdoor resources including Lake Coeur d’Alene a 31,872 acre lake with opportunities for fishing and water sports, not to mention the numerous hiking and biking trails in the forests nearby. The campground has 16 campsites with fire rings and tables, two restrooms and there is potable water. This campground is not handicap accessible and is classified as a tent campground because of the lack of power hookups for trailers. There’s one paved road through the campground and a group shelter for use by campers. All campsites are first-come, first-served and there are areas for group camping. Check-in time is 9 am and check-out time is 8 p.m. Maximum occupancy is 100 people. Location: Follow I-90 5 miles East of Coeur d’Alene, ID, then take exit #22 (Harrison-St. Maries) off of I-90, turn south on State Hwy 97 for 2-1/2 miles to Forest Road 438, turn east and follow paved road 1 mile to campground (there are signs). 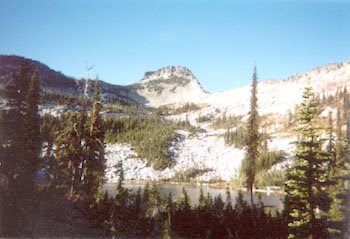 Bernard Peak is located in the Idaho Panhandle National Forest with its scenic mountains, pristine forests and abundant wildlife. It's also located on the banks of Lake Pend Oreille, the state’s largest lake with a surface area of 94,600 acres and numerous forested coves, a flat-water paradise. As for the trail, Bernard Peak is an intermediate level ride with a good cardiovascular workout, challenging switchbacks and some great single-track. A more secluded trail with dense forest cover this trail is a great place to stay cool on those hot summer days. This trail is not known for its views because of the dense forest cover, which makes it unique if you like the deep dark forests. The trail can be taken as an up-and-back trail topping out at the summit of Bernard Peak. 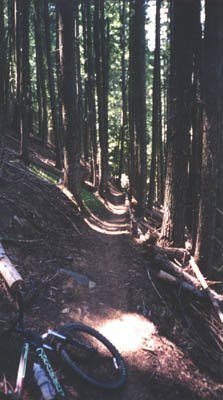 The route is mostly single-track with a few old logging roads on the bottom section. The trails smooth but demanding with an elevation gain of approximately 2600ft over 4.5 miles. This trail is not for the faint of heart. The other option for those not up for a hard workout is to drive to the top and just downhill it. Directions - From I-90 in Coeur d’Alene Idaho, head north on Highway 95 to Athol Idaho. At the light in Athol Idaho go east or right on Highway 54 for 4 miles and you will come to the navigation circle. Head south here on Goodhope Road for about a mile to Twete Road.At Twete Road take a left and drive past the gravel pit to the end of the road and the trailhead. NOTE: If you want to just downhill it and drive to the top you can by continuing south on Goodhope Road for 1 more mile (2 miles total) to Bunco Road. Take a left on Bunco Road and travel 2 more miles to the entrance into the National Forest and the end of the pavement. There’s a big parking lot here for snowmobiles in the winter, just head past it and up the hill on FSR #332. At the top of the hill (~4.2 miles) you will come to a side road FSR #2707. Take a left and follow it up the hill making sure to stay to the left at the forks up ahead (~.25 miles). It’s about 2 miles to the top, but make sure you stay to the left on the way up. The road is rough and the vegetation is thick, so don’t go up the last section if you like the paint job on your car. Located in the Idaho Panhandle National Forest, a land of dense forests, abundant wildlife, scenic mountains and giant cedars, is Upper Beehive Lake one of the highest lakes in Idaho at 6457ft in elevation. This is a great trip providing access to the Selkirk Crest Scenic Area and views of the Pack River Valley. The route is midly steep with good scenic rewards along the way. The trailhead starts at about 4500ft and climbs to just under 6500ft over ~ 4 miles one-way. An elevation gain of ~ 2000ft, the trail is in decent condition with only one creek crossing (be careful when wet) and a few trees to crawl over. Toward the end of the climb, the trail gives way to a rock face that's steep but a comfortable angle for walking. From this point route finding is simply keeping the steep rock face on your left and following the ridge of trees up. There are little man-made rock piles along the way to help guide you. You can’t miss the lake because the rock face on the left and the tree lined ridge on the right come together and meet at the lake. Directions - From Sandpoint Idaho take Hwy 95 north ~ 13 miles to Pack River Road #231. Turn left onto Road #231 and go ~ 18 miles to Beehive Lakes Trailhead, which is located on the left side of the road. NOTE: You will need good clearance on your vehicle to travel on FSR #231.